Apple recently released iOS 11, and now everyone in the industry is talking about ARKit, Apple’s SDK that lets developers build augmented reality apps. ARKit helps app makers move beyond simple 2D camera overlays, and at the same time it’s simpler to use than more complex solutions like Snapchat’s. Some people in the industry believe that ARKit could help Apple directly compete with Google in terms of phone-based augmented reality products. What exactly does ARKit do? Apps developed with the help of ARKit put 3D images into the real world using what’s called visual inertial odometry. Visual odometry estimates the position of a moving camera in three dimensions relative to its starting position. This typically involves tracking a bunch of interest points (corner-like pixels in an image) across images in a video and then using 3D projective geometry to estimate their relative positions. What are the technical requirements for ARKit apps? To use ARKit-enabled apps on iOS 11, you must have an iOS device with an A9, A10, or A11 processor. This means ARKit apps can run on the iPhone 6s, iPhone 6s Plus, iPhone 7, iPhone 7 Plus, iPhone SE, iPhone 8, iPhone 8 Plus, and iPhone X. For iPads, you can use the 9.7-inch, 10.5-inch, and 12.9-inch iPad Pro (both generations) or the 9.7-inch 2017 iPad. What do we know about ARKit? could significantly cut development time. Generally speaking, developers can use Apple’s new machine learning framework to identify objects in a scene. But Apple is using AR differently than Facebook or Google. Apple’s advantage with ARKit is that it works with iOS, which has a less fragmented ecosystem than Android, as Apple controls both the hardware and software for all its devices. Soon after ARKit was released, independent software developers created some incredible-looking experiences for the iPhone – everything from virtual portals to virtual zombies in your living room. What are the most popular examples of ARKit in use? Some of the most popular AR features are various types of filters, or so-called “lenses,” that add to selfies or change your face altogether. Let’s look at some of most popular examples in each category. Augmented appearance applications let users apply stickers and filters to change people’s looks, from hair color and complexion to creating the illusion of full evening makeup. ModiFace is one of the market leaders when it comes to AR-powered apps for the beauty industry. They provide AR modules as well as so-called “magic mirror” software. Beauty brands like Sephora use ModiFace software to provide a unique experience to their customers – no more messing around with lipstick or eye shadow testers in the store. Customers can just look in the Sephora app’s mirror and swipe to see how colors blend and look on their face. ModiFace offers solutions that are accessible through any browser and can be deployed easily. Another popular app that ModiFace has authored lets users instantly change their hair color. Apple documents in detail how developers can use its augmented reality technology stack to create apps that allow real faces to interact with virtual objects, where the virtual object is rendered as a 2D camera image while the virtual content is rendered as a 3D object. Real-estate and home design and decor apps help users generate floor plans and imagine what their living room would look like with a new set of furniture. TapMeasure is a great tool that is used to measure your interior space. It has various features including a 3D room builder that can create room models to scale, capture point-to-point measurements, and ensure that your artwork is perfectly level. TapMeasure lets users share their 3D models through a simple URL. PLNAR is a popular application that provides useful tools for generating building plans. These tools can be used by everyday homeowners as well as flooring businesses and interior designers. To use this app, simply guide a cursor along the edges and around the corners of the floor and it will generate measurements of a room’s area. You can also mark doorways and use the app’s tools to measure other objects with flat surfaces, such as countertops. All this data is saved for custom projects. Housecraft is another great find for people who like custom projects and are looking for a convenient digital tool to help with their home redesign. Housecraft places fully rendered 3D models anywhere in your home. In one of our previous articles, we mentioned the Ikea Place AR app and how it has a lot of utility and provides plenty of entertainment. This app scans a room and lets you see how Ikea furniture will look in the context of your home. Other brands, such as Magnolia market, have also created their own AR experiences that help users imagine how items of decor in a store will complement their apartment. The Houzz app is a product with a similar idea that’s based on an extensive database of design samples and a home decor marketplace. Users can browse this marketplace and see how products will work in their own interiors. AR is only one of Houzz’s features, but it clearly makes the app a strong competitor. AR-powered apps are becoming more and more popular in teaching, making lessons more practical and complementing other educational methods in various contexts. These apps cover a wide range of subjects – from anatomy to coding in Swift. Augmented reality is a great tool when it comes to teaching practical skills such as design, technical drawing, and sketching. SketchAR helps aspiring artists practice their skills. All you need to do is draw a few circles on a piece of paper, and the app will recognize them and helps you draw your picture around them. SketchAR provides a library with various categories of images, including animals, flowers, and food. AR apps are also great for learning about nature and the world around us, and are often equally exciting for teenagers and adults. Astronomy is a popular subject for AR apps. SkyORB is a great tool for astronomy fans. It includes a 3D star map and 3D planetarium as well as a sun clock. Users can point their device toward visible stars and planets to reveal their names based on the device’s GPS position. The app also sends notifications if there’s a full moon or any other astronomical phenomenon worth observing. The Augmented Reality Solar System app helps users learn more about the planets of our solar system. This app gives users a way to explore planets in a realistic scale, providing a vivid comparison between Earth and its neighbors. Users can also scale the orbit radius to better understand distances among planets. 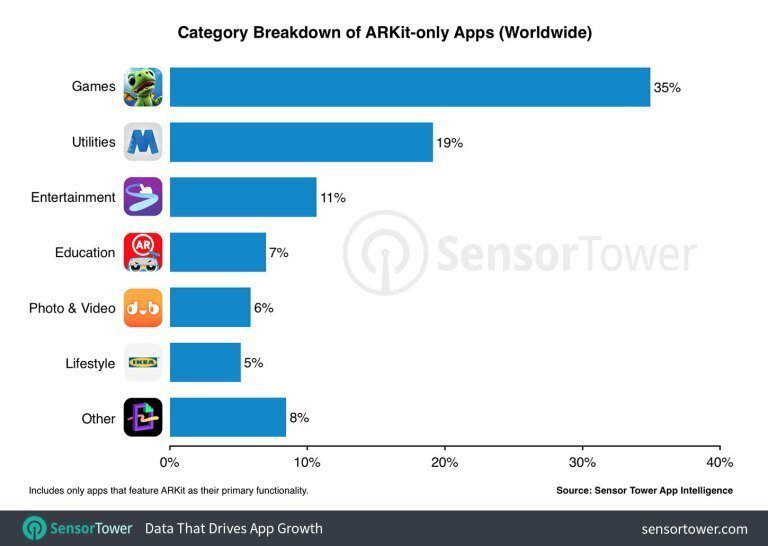 It’s clear that ARKit apps will be a significant part of the App Store, and a lot of Android users are wondering if Google is going to seriously compete with Apple in this field. What’s the ARKit alternative for Android users? Google recently previewed its ARCore software development kit, which is similar to ARKit. The ARCore kit also adds augmented reality functionality to existing Android phones. ARCore apps will run on the Samsung Galaxy S8 and Google Pixel to start, and will come to millions more Android devices running Android 7.0 Nougat and above sometime this winter.